Successfully Added MP4 Watch With 1.8 Inch LCD - 8GB Excalibur Steel Edition to your Shopping Cart. 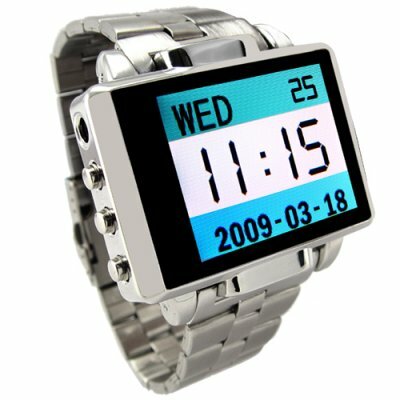 This all-metal multimedia digital watch with large display is simply an amazing timepiece, featuring many functions you don't see on other media products. When you think of a quality digital timepiece, what do you think of? Quality construction with stainless steel parts and reliable time keeping, right? How about if we add to that the ability to play digital media files, a still and video camera, and the ability to store and transport files like a standard USB flask disk? Would that be even better? Well then, here it is, this watch is all that in spades! And it looks good too!! For the boy in all of us, the built-in digital camera lens is strategically placed on the top side of the watch for easy capture of daily events and you can take stills or full length video, great for catching some personal memories or for public events you want to upload to youtube. Sound is also important attribute with this watch, with 4 equalizer presets, a built-in speaker and of course an earphone output (3.5mm) that's great for the provided earphones or for you to upgrade to your own favorite pair. Yes, this watch is as good as it sounds. We encourage you to order your sample today at a great wholesale price and see the quality of our newest MP3/MP4 watch for yourself. You will not be disappointed! Great watch, i wear it everyday, plug it into my car, and listen to music at work. Just got the watch today and it's pretty cool. Recording video on it and taking still shots with the camera is fun. But it takes a little while to get use to the settings on the watch. It took me a little while to find the media that I put on the watch. Also I wish there was a choice to change the military time to regular time but I don't think you could. For all the stuff it could do it is worth the money but give yourself a little time with it before showing it off. this watch is very nice, the pictures and videos it takes are pretty good for such a very smaller camera, battery life is resonable, it holds a lot of music, but how do change it to 12 hour time instead of 24 hour time thats the only thing i cant do. I LOVE THIS WATCH. EVERYBODY WANTS A WATCH LIKE THIS. GREAT PRICE.